Welcome to Spently! The easiest way to get started is to create a store email set. You can do this from the main dashboard of the app, by going to quick create and then store emails. Then select a theme for your store email set. Once in the builder you can drag and drop components onto your template and edit them on the right. Every global settings change you make will persist on all of your emails. Each template by default comes with our recommendations of marketing sections. This could be in the form of various product recommendations, discounts or referral sections. Feel free to configure these as you see fit, swap them out, or remove them. Keep in mind your store emails are the highest opened emails you can send your customers, so using marketing components is a great way to drive repeat sales. Our merchants typically see a 15% increase in total store sales! Once you have made your way through all 15 store emails you will arrive at an export all screen. This is where you will copy the html for each email template to be pasted into your Shopify Notification settings in your Shopify dashboard. 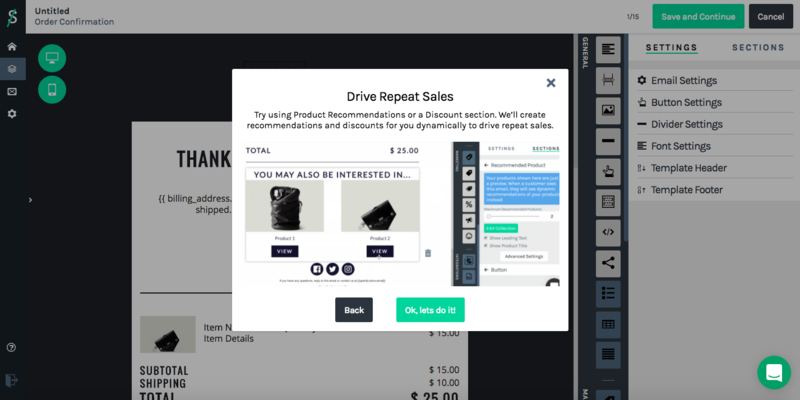 Simply copy the html provided for each store email type and select the green "Click here" hyperlinked text to be taken to the right page in your Shopify dashboard. Replace the html that is there, with the html we provide you, send a test email, and hit save.